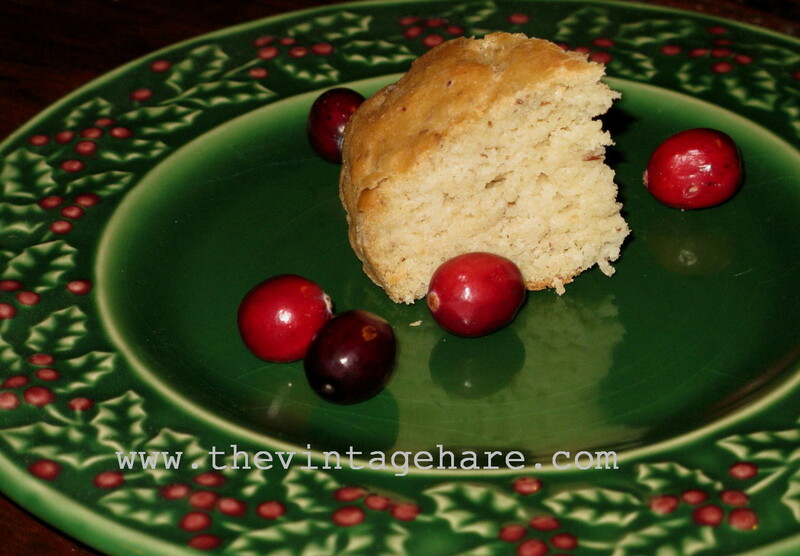 Here is another gluten free alternative to a recipe/idea in the archives! 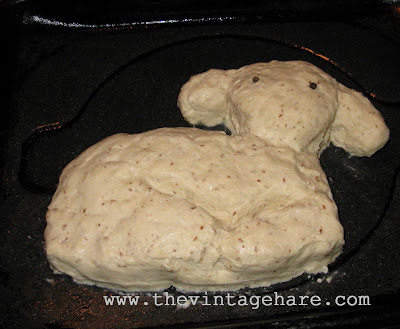 This one was submitted by Monica, from The Vintage Hare. Thank you Monica! 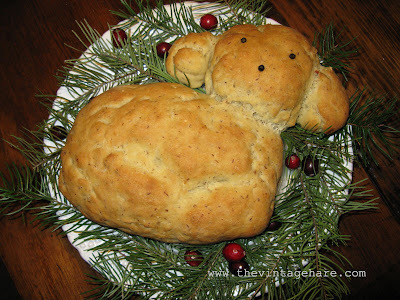 Here's a fun gluten free bread idea that can be used for Christmas, Easter or even to adorn a Saint Joseph Altar (Table). If you don't eat gluten free, you can substitute 3 cups of wheat flour for the rice, sorghum, tapioca, potato starch and quinoa flours. You would also omit the water, xanthan gum and most likely use less salt and maybe only one egg, but with making substitutions, it is good to have some bread-making experience as I've not tried this except as a gluten free bread. 1/4 cup of water + 1/4 cup water (water should be warm) You can substitute warm milk here. Thoroughly mix dry ingredients in a large bowl. Set aside. Spray a baking pan with cooking spray. 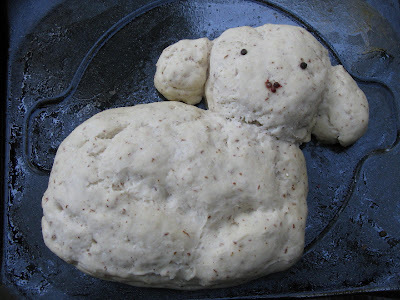 Shape the large ball into a longish oval shape for the Lamb's body. Shape the medium ball into a triangular shape for the head. Shape the two small balls into ovals and set them next to the head. Wet your fingers and smooth the dough. Water is great for smoothing out the imperfections! Add peppercorns to make the eyes and nose. Set in a warm place to rise. 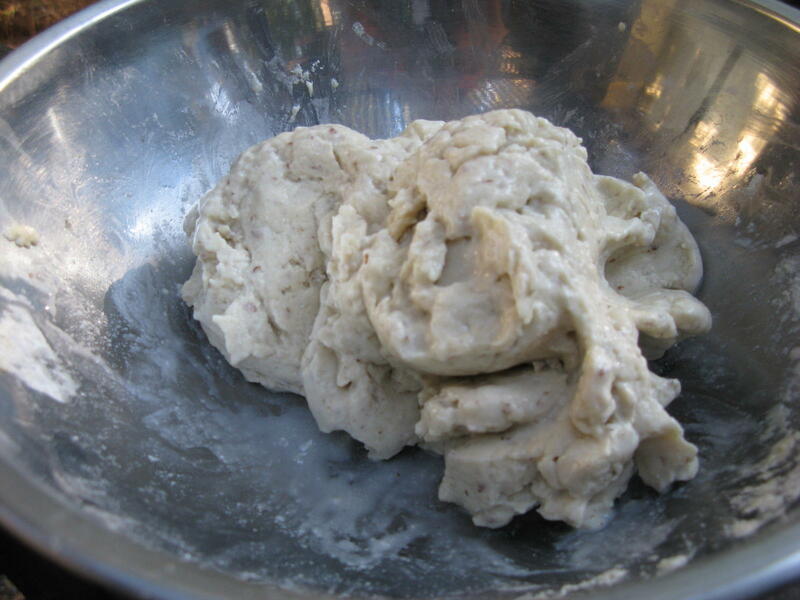 After 30 minutes the dough should feel dry. Cover lightly with plastic wrap to keep it from drying out too much. Allow to rise another 1- 1 1/2 hours. Set in a 350 degree oven. Bake 25-30 minutes and then baste with melted butter to brown the Lamb. Bake an additional 5 minutes or so until browned. (Watch it closely so that it does not get over done.) Cool. Using a spatula positioned under the head and partly under the body, transfer to a platter. 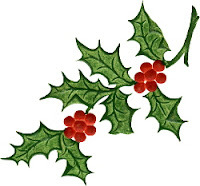 Add greenery such as rosemary along with cranberries to decorate. (Yes, those are washed and dried fir boughs in my picture!) Serve with butter. Yum! 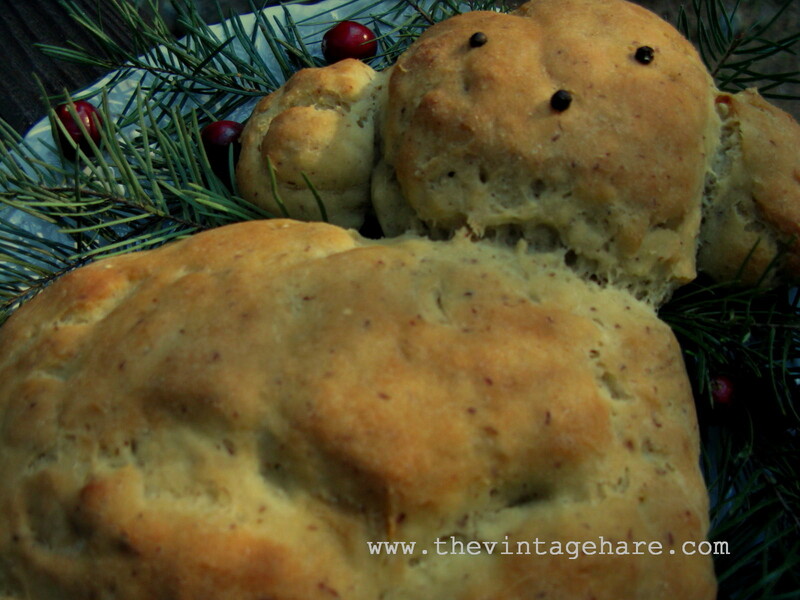 The bread has a moist texture and a very slight nutty flavor, but it is as close to wheat bread in flavor as it gets. At least according to my own taste buds! weighing 7lbs. 5oz. Mom and baby are doing great! More details later. Thank you for your prayers! 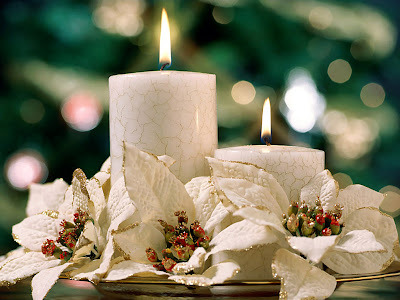 Please pray for our lovely blog hostess, Jessica and her little man. She has been in labor for the past few hours and might still have another few more to go. Baby Boy is definitely making his appearance today! O great Saint Gerard, beloved servant of Jesus Christ, perfect imitator of your meek and humble Savior, and devoted child of Mother of God, enkindle within my heart one spark of that heavenly fire of charity which glowed in your heart and made you an angel of love. O glorious Saint Gerard, because when falsely accused of crime, you did bear, like your Divine Master, without murmur or complaint, the calumnies of wicked men, you have been raised up by God as the patron and protector of expectant mothers. Preserve Jessica from danger and from the excessive pains accompanying childbirth, and shield the child which she now carries, that he may see the light of day and receive the purifying and life-giving waters of baptism through Jesus Christ our Lord. Amen. St. Gerard, pray for us! Lucy, patron of Sicily, and one of the saints of the Canon of the Mass, was martyred at Syracuse in the persecution of Diocletian about the year 304. The legend of her martyrdom says that she was denounced as a Christian by a rejected suitor. Refusing to apostatize, she was condemned to a brothel, but a mysterious force prevented the persecutors from moving her from the tribunal. After an unsuccessful attempt had been made to burn her to death, her neck was pierced with a dagger. 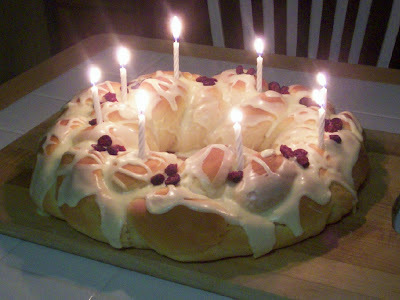 This is a late addition for this feast day since it was a surprise from my eldest daughter, Rose. 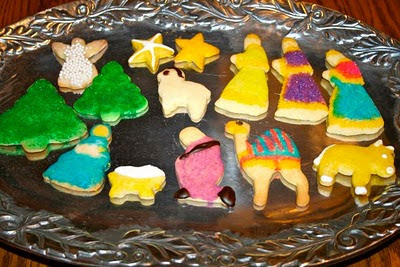 Because of her surprise, they will forever be referred to us as St. Lucia’s Cookies. "O virgin Lucy, why do you ask of me what you yourself can procure for your mother? For your faith too has come to her aid and therefore she has been cured. By your virginity you have indeed prepared for God a lovely dwelling." Whisk the coconut flour and the baking soda together in a med. bowl. Mix together the coconut oil, maple syrup, eggs, salt, and vanilla in a large bowl. Add the the dry ingredients into the wet, mix. Bake at 350 for 13 minutes. 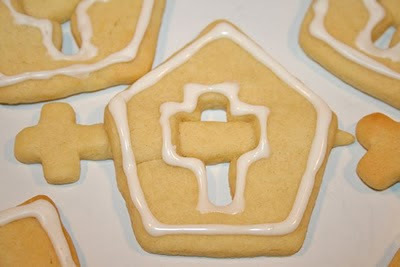 The consistency of these cookies are a bit flakey and soft. However, they are a fine replacement to the traditional version. 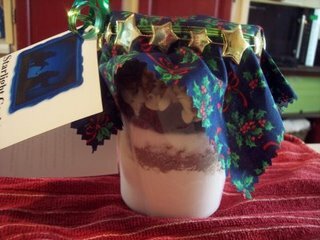 The following recipe was submitted by Jeannine, from Grace and Peace. Thank you Jeannine! These are gluten-free cinnamon buns, and they are, in my opinion, easier to make than ordinary cinnamon buns! No rising time! I think I found a link to the original once when I was poking around Sarah's charming Amongst Lovely Things, which is, indeed, lovely! They may be refrigerated overnight in the pan, and then baked up the following morning! Sometimes we must toy with the plan and have them for dessert rather than breakfast, but my daughter always gets to carry them in on a tray. We stick candles into the buns rather than atop her head! I usually just make a glaze with two tablespoons of soft butter or shortening and about a cup of confectioner's sugar, thinned with a few drops of milk or almond milk. Add a sprinkle of salt (yes!) and a few drops of pure vanilla. 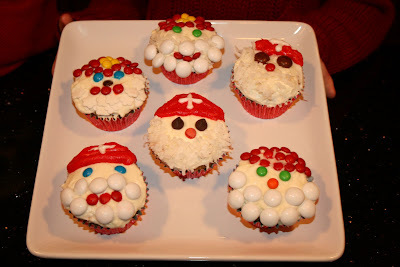 It would be easy to use commercial vanilla frosting from a can, too. 2. Grease a round pie pan. 3. Add yeast to warm milk, plus a couple of spoonfuls of sugar from your measured 1/4 cup sugar. Combing thoroughly and let it bubble a bit. 3. In a medium bowl, combine sugar and butter. 4. Add yeast/milk mixture to sugar/butter mixture. 5. Add remaining ingredients. Dough will be very, very soft, but the xanthan gum will work its magic and make it stretchy enough. 6. Lay down a 14" long strip of plastic wrap on your counter. Sprinkle a couple spoonfuls of additional white sugar on the wrap. 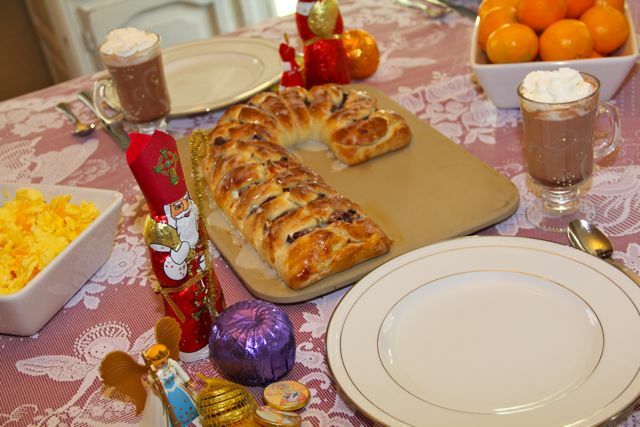 Lay the ball of dough on the sugared wrap. Lay another 14" strip of plastic wrapover the dough. Pat the dough down to make a rectangle that fills the plastic wrap almost to the edges. I use a rolling pin, too. Lift the top wrap periodically to reposition if necessary. The dough is incredibly sticky, but the plastic wrap tames it magically. Remove the top piece of wrap when you are satisfied with your rectangle. 7. Combine the filling ingredients. Sprinkle evenly over dough. Use the plastic wrap to roll the dough. Slice the log into 10-12 slices. 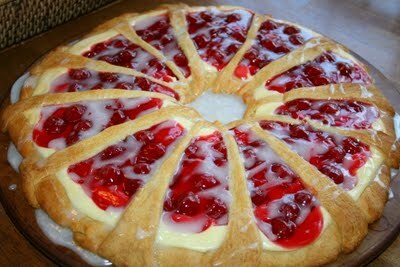 Lay the slices touching in your greased round pie pan. Bake 20 minutes. Frost while warm. Sprinkling the additional sugar on plastic wrap. Using the plastic wrap to roll the dough. These are heavenly. 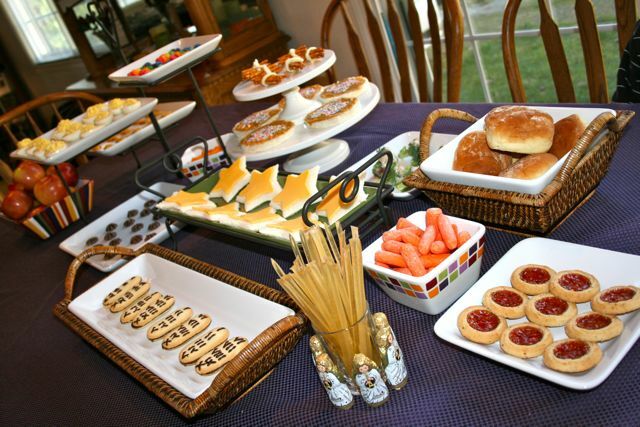 The whole family will appreciate them, but especially your gluten-free loved ones. I do hope you try them. Lovely for St. Lucy, or for any time during the Christmas season! 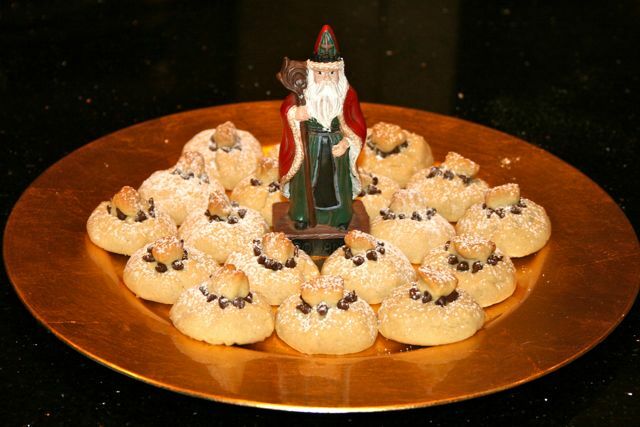 Additional recipes for celebrating Santa Lucia Day can be found in the archives. Champurrado por Nuestra Dulce Madre! 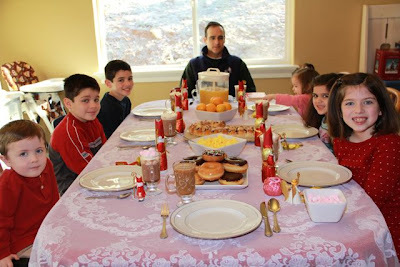 …Champurrado for Our Sweet Mother! On this beautiful feast of Our Lady of Guadalupe we will be celebrating with a few books, coloring pages and food. I think I've mentioned before that in our family food is a BIG part of the way we celebrate. So, after a conversation with a sweet friend on facebook the other day, I decided to make Champurrado to go with tonight's dinner of shredded chicken burritos and tacos. 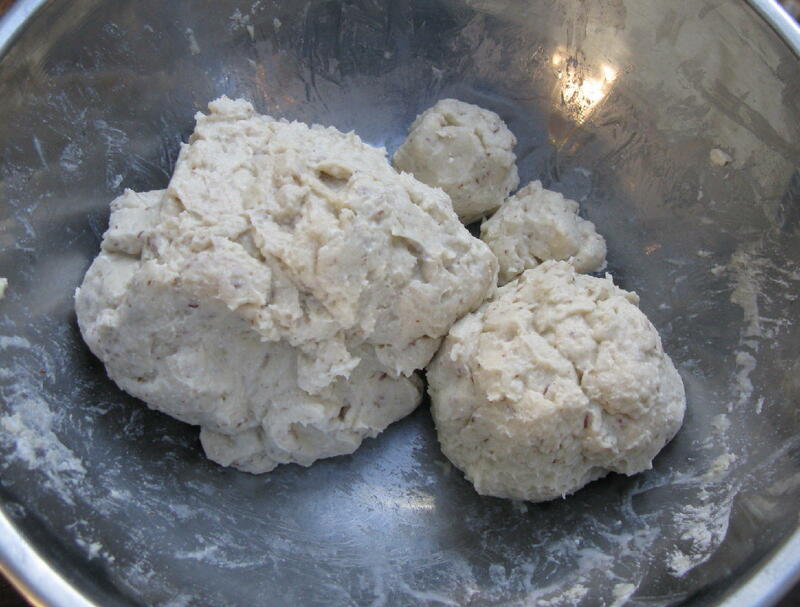 In a small mixing bowl combine the masa harina with 1/2 cup of water mixing by hand to form a paste. In medium saucepan add the paste and the remaining 3 cups of water. Bring to a boil stirring constantly. Cook slowly for 20 minutes, the mixture will thicken. While this mixture is simmering, in another saucepan add the milk and bring to a boil. Add the chocolate and cook for about 10 minutes until the chocolate has completely dissolved. Pour the chocolate into the masa harina mixture stirring until well incorporated. With a milinillo or an eggbeater, whisk until a foam forms on the top, about 3 minutes. Serve in a large bowl, spooning some of the foam on top. On December 7th we celebrate the feast of St. Ambrose of Milan. 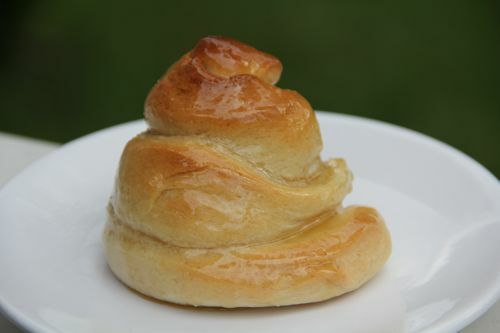 Here is a great recipe for Beehive Buns, which I made this past June for our last Good Shepherd's Garden Party. The recipe is originally from an Easy to Bake, Easy to Make recipe card. Dissolve yeast in warm water in a large bowl. Let stand 5 minutes. 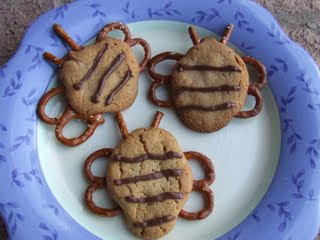 Stir in milk, 1/4 cup honey and 1/4 cup butter. Stir in salt and enough flour to form a soft dough. Knead dough on a lightly floured surface until smooth and elastic, 6-8 minutes. Place dough in a greased bowl turning to grease the top also. Cover and let rise in a warm place until doubled in size, about 1 hour. Lightly grease or spray a baking sheet with nonstick cooking spray. Punch dough down; divide in half. 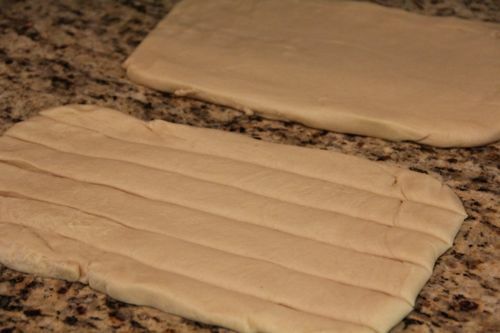 Roll each half of dough into a 12 X 6 inch rectangle. Cut one inch strips from the long edge of each rectangle. Curl into a behive shape with a wider base and narrower top on the baking sheet. Cover; let rise until doubled in size again, about 15 minutes. Preheat oven to 375 degrees. 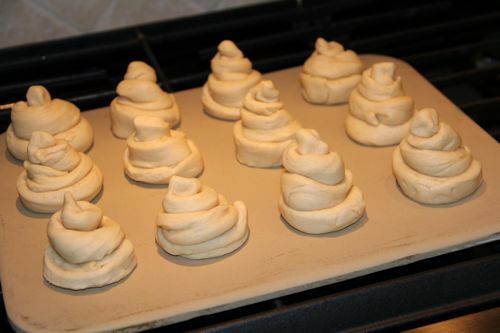 Bake buns until golden, 15-20 minutes. Combine remaining honey and butter in a small saucepan. Heat until butter melts. 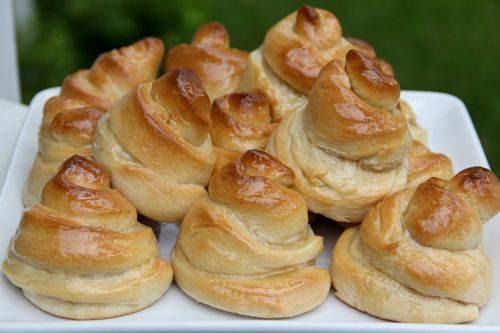 Brush warm glaze over buns. Additional recipes for the feast of St. Ambrose can be found in the archives. 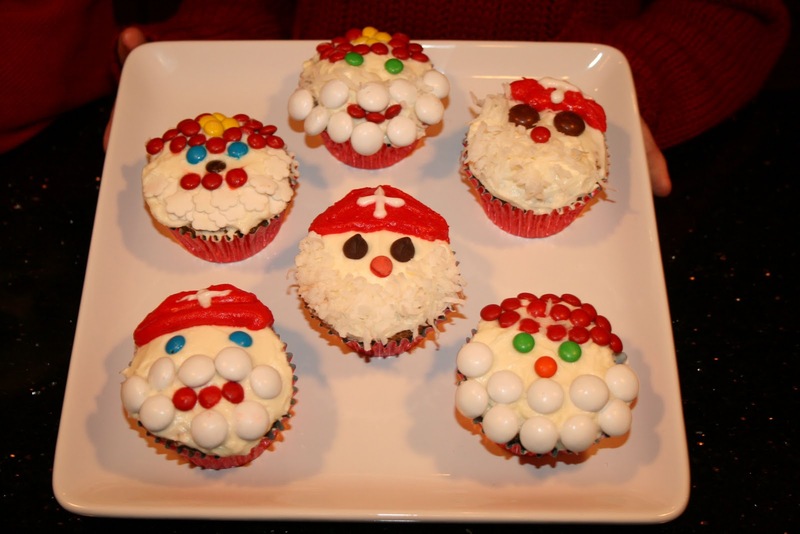 This recipe was submitted by Jamie, from Ad Silvam Ibimus. Thank you Jamie! 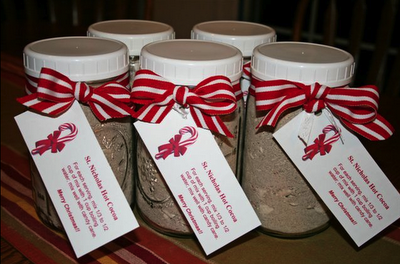 I tweaked the original St. Nicholas Cocoa Mix recipe to come up with a dairy free version for my son. I had looked high and low online and didn't find anything...so thought this might be helpful for other readers. The results were delicious and we could taste no difference. 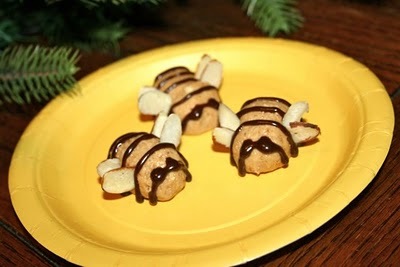 Combine powdered milk, cocoa, powdered sugar, marshmallows and peppermint candy; mix well. Store in an airtight container. For each serving, put ½ cup of mix in a regular-size mug, fill with boiling water. Our family enjoyed a delicious brunch this morning, complete with our annual Candy Cane Coffee Cake, Oranges and St. Nicholas Hot Cocoa with Peppermint Mini-Marshmallows, plus Chocolate St. Nicholas Treats and St. Nicholas Coins for all the children. I'll post about our celebration later, since I need to head to town for my 36 week OB check-up this afternoon... 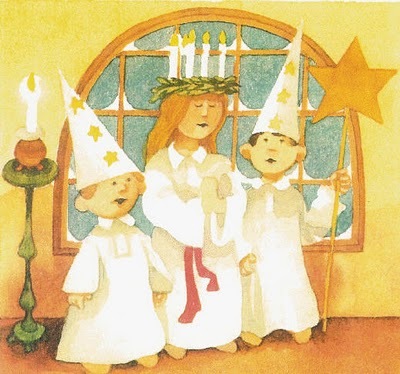 However, in the meantime, I thought I'd add a linky here for whoever would like to share pictures from their own St. Nicholas Day Celebrations! 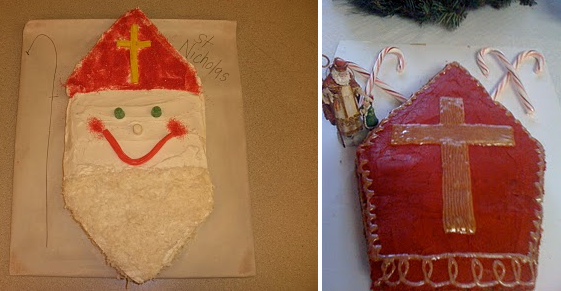 We are sharing this year's Mighty Miter Cake, following the same instructions as last year with a slight change of color. 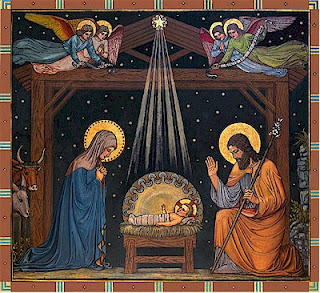 God Bless your feast day celebrating the "Champion of the People!" 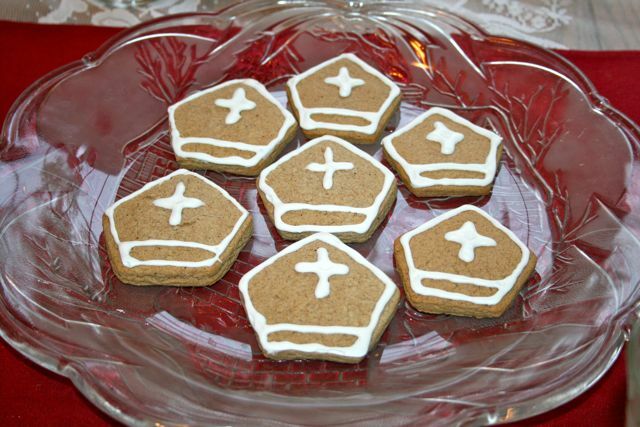 View all recipes for St. Francis Xavier here. 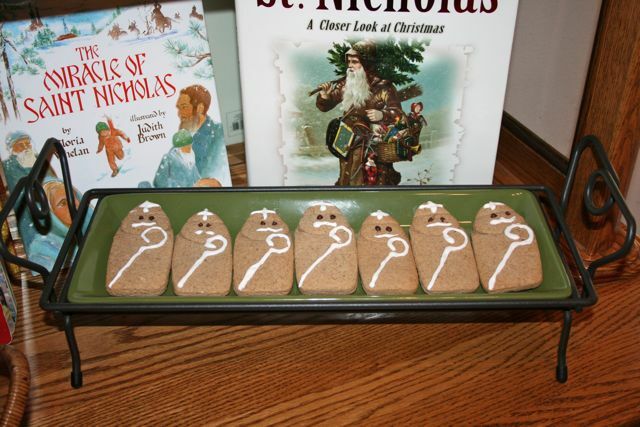 Note: After sharing this idea with the St. Nicholas Center, they came up with a few more printables! Here is the link. 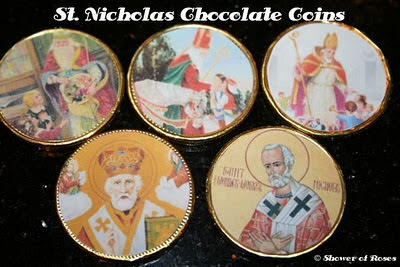 If you'd rather not make your own, you can also purchase pre-made St. Nicholas Coins from Emmanuel Books or Paidea Classics. View all recipes for St. Nicholas here. 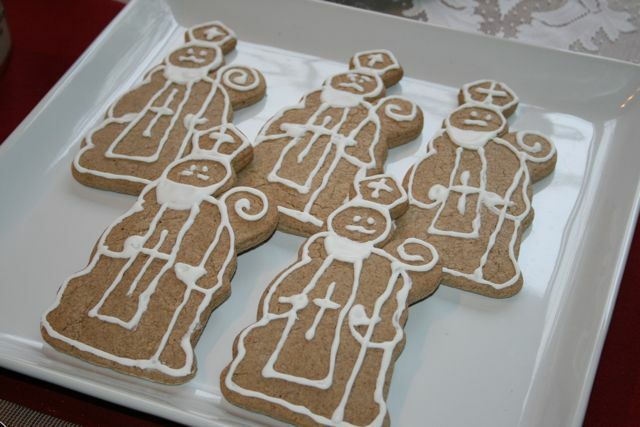 View all recipes for St. Ambrose here. View all recipes in honor of the Immaculate Conception here and all recipes in honor of the Blessed Virgin Mary here. View all recipes for St. Juan Diego here. 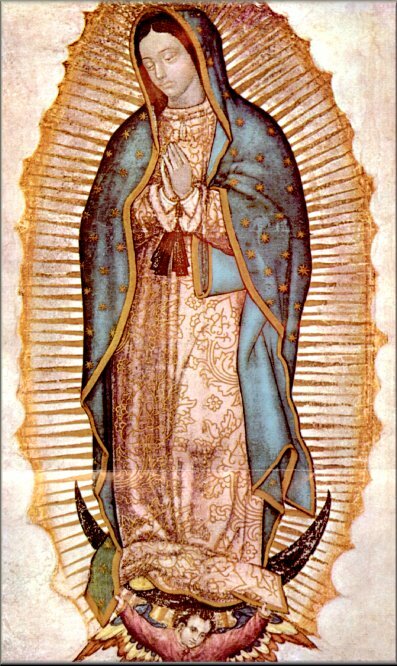 View all recipes for Our Lady of Guadalupe here. View all recipes for St. Lucy/Santa Lucia Day here, or visit last year's Santa Lucia Day Link Up for even more ideas! 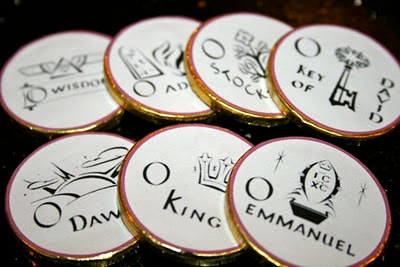 View all O Antiphon recipes here. 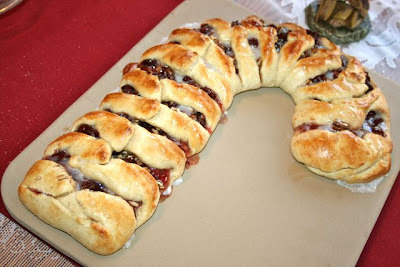 View all Christmas Recipes here. 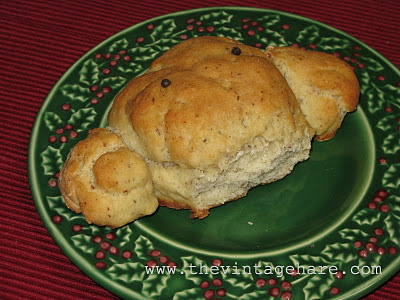 View all recipes for St. John the Apostle here. View all recipes for the Holy Innocents here. 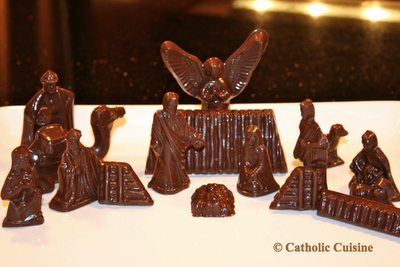 View all recipes for St. Thomas Becket here.